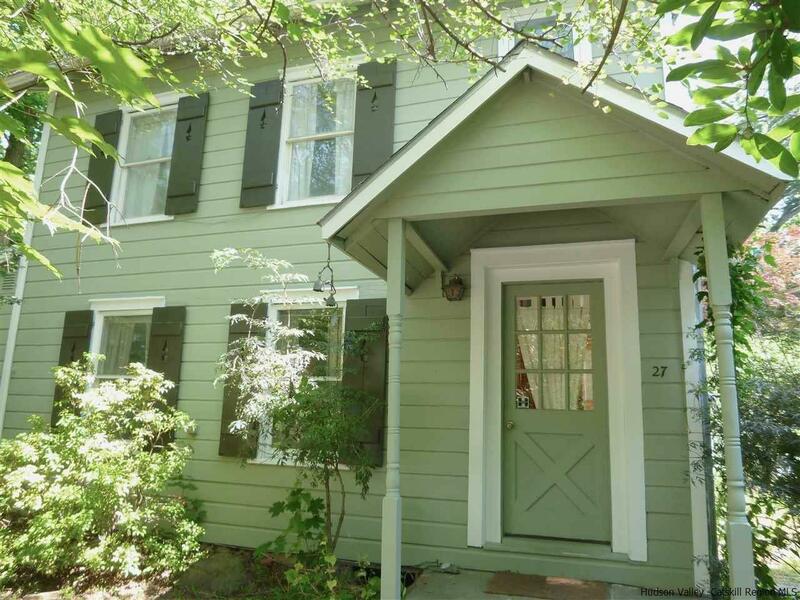 Walk to the Millstream from this classic 1920 Woodstock Village cottage. This home has the charm and character that everyone wants. Hidden from plain sight yet right in town, enjoy being close to all the restaurants and shops, & to the NYC bus. No need for a car if you don't want to have one! The long galley kitchen is bright and sunny with a breakfast nook at one end from which to enjoy your coffee or cocktails with a view of the back patio and stone wall through French doors. Bluestone patios in the back and side yards are great for gardening and BBQ's and there is a favorite spot on the lawn for lazing in the hammock throughout the Summer, and if it gets too hot, just head over to the swimming hole up the street for a dip. The living room is sizeable with a fireplace to snuggle up to in Winter, and the windowed room beyond can serve as a family room, office space, artist studio or extra sleeping space. Upstairs are 2 bedrooms and a full bathroom. A perfectly manageble size for a weekend getaway or investment home in the heart of Woodstock. 2 hours from NYC, enjoy all that our famed artist's community has to share - Shopping, restaurants, music, performing arts, Woodstock school of Art, Byrdcliffe Artist's Colony, Tibetan Monastery, hiking, fishing, nearby skiing, scenic bike routes, rail trails, farmers' markets.